The particle-tracking algorithm used by the Particle Track tool employs a predictor–corrector scheme of predicting the future location of a particle based on the local velocity field, as interpolated from the nearest raster cell centers, similar to that employed by Konikow and Bredehoeft (1978). The successive locations of the particles are not tied to the resolution or location of the raster cells, so they are free to float through the velocity field. 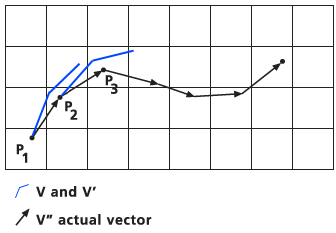 Starting at the source location P identified in the track file, the local velocity V is calculated from the velocities at the four nearest raster cell centers using a bilinear interpolation function as demonstrated in the image below. Determination of the path is carried out by a predictor–corrector method, as illustrated in the image below. 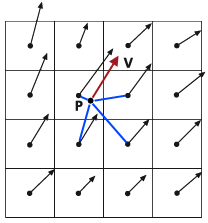 Beginning at point P, whose location is independent of the raster cells, the velocity V is interpolated from neighboring cell centers and used to predict the particle location P' at a distance you specify (this is the value of the Step length argument). At point P', a new velocity vector V' is interpolated from its neighbors and averaged with V to create a corrected velocity V''. This corrected velocity is used to find a new location P'', which is used as the point of origin for movement in the next tracking step. The time necessary for moving from P to P'' is also deducted from the remaining time. This technique is applied in succession (as demonstrated in the image below) until either the specified time expires or the particle migrates off the raster or into a depression. As each point is calculated, the cumulative time, location of P in x and y, cumulative length, and flow direction and magnitude are recorded in the track file described above. The groundwater tools can be used to perform rudimentary advection–dispersion modeling of constituents in groundwater. Darcy Flow generates a groundwater flow velocity field from geologic data, Particle Track follows the path of advection through the flow field from a point source, and Porous Puff calculates the hydrodynamic dispersion of an instantaneous point release of a constituent as it is advected along the flow path. A complete discussion of advection–dispersion modeling using these functions is presented in Tauxe (1994). The typical sequence for groundwater modeling is to perform Darcy Flow, then Particle Track, then Porous Puff. Konikow, L. F., and J. D. Bredehoeft. 1978. "Computer Model of Two-Dimensional Solute Transport and Dispersion in Ground Water". Vol. 7, Chap. 2 of USGS Techniques of Water Resources Investigations. Washington, D.C.: U.S. Geological Survey. Tauxe, J. D. 1994. "Porous Medium Advection–Dispersion Modeling in a Geographic Information System". Ph.D. diss., University of Texas, Austin.